Em 18 de Março de 2003, Si Fu pendurava o "Jiu Paai" , símbolo de sua Família Kung Fu , na parede pela primeira vez. O Jiu Paai é ofertado ao discípulo pelo seu Si Fu, ele não pode ser feito por decisão do próprio discípulo, pois o seu valor está no símbolo da entrega. 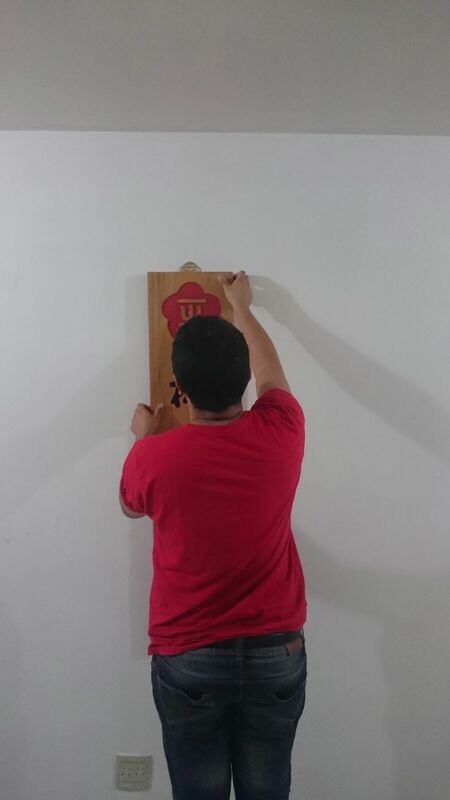 On March 18, 2003, Si Fu hung the "Jiu Paai", symbol of his Kung Fu Family, on the wall for the very first time. Jiu Paai is offered to the disciple by his Si Fu, it can not be done by decision of the disciple himself, as its value is in the symbol of delivery itself. O jovem Si Fu Julio Camacho ainda não sabia quem seriam seus discípulos. Thiago Silva e Carlos Antunes eram nomes que ainda nem em sonhos passavam pelo sua cabeça.Assim como todos os outros. Porém, alguns deles, como eu, Vladimir e Si Hing Leonardo, já faziamos parte do Núcleo Jacarepaguá. Mas ainda faziamos parte da Família Moy Yat Sang, não tinhamos decidido migrar para sua Familia ainda. De fato, eu nem sabia que isso era possível. Por isso, temos que todos agradecer ao pioneirismo do Si Hing Leo em pensar nessa possibilidade antes de todos. The young Si fu Julio Camacho still did not know who would be his disciples. Thiago Silva and Carlos Antunes names were not even in dreams passed by his head. So like everyone else. But some of them, like me, Vladimir and Si Hing Leonardo, were already part of Jacarepagua School. But still were part of Family Moy Yat Sang, we had not decided to migrate to his Family yet. In fact, I did not even know that was possible. Therefore, we must all thank the pioneering of Si Hing Leo to think of that possibility before everyone else. 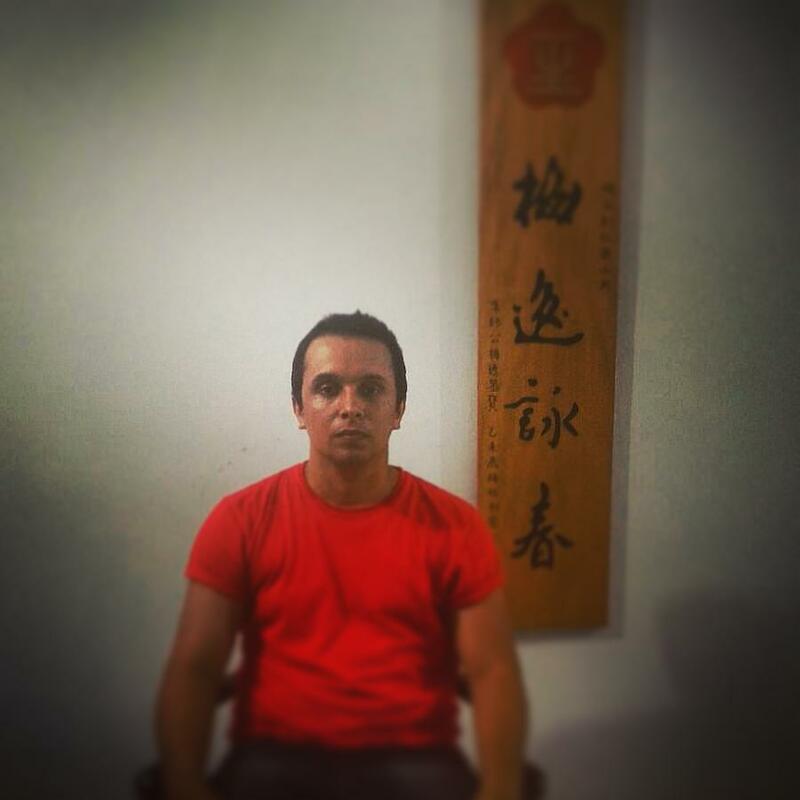 Para que o Mo Gun ficasse de acordo com aquele momento, os irmãos Kung Fu de Si Fu na época como Si Suk André Cardoso (foto de óculos) foram essenciais. E seus futuros To Dai como Vladimir Anchieta (foto) e Nelson Carvalho (ao fundo) também ajudaram. For the Mo Gun be according to that night, the brothers of Si Fu at the time as Si Suk André Cardoso (photo wearing glasses) were essential. 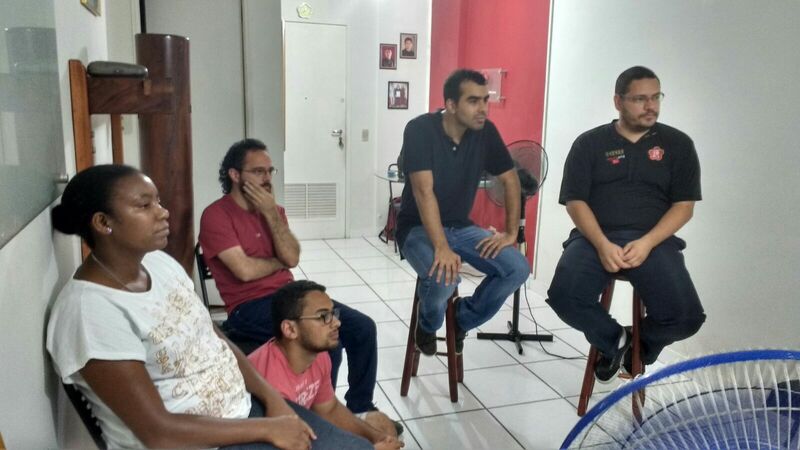 And his future students as Vladimir Anchieta (photo) and Nelson Carvalho (background) also helped. A jovenzinha Ursula Lima(foto) , hoje a única mulher em todo o mundo que é Mestra Qualificada pela Moy Yat Ving Tsun International Federation, naquela noite ajudava seu Si Hing Julio nessa nova fase. 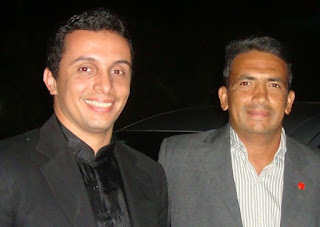 Ainda faltavam 7 anos para que ela se tornasse Mestre a partir daquela noite, mas todos esses despertares ainda estavam no campo da imanência. The youngling Ursula Lima (photo), now the only woman in the world that is qualified Master by Moy Yat Ving Tsun International Federation that night helped her Si Hing Julio in this new phase. There were still seven years for her to become Master from that night, but all these awakenings were still in the field of immanence. 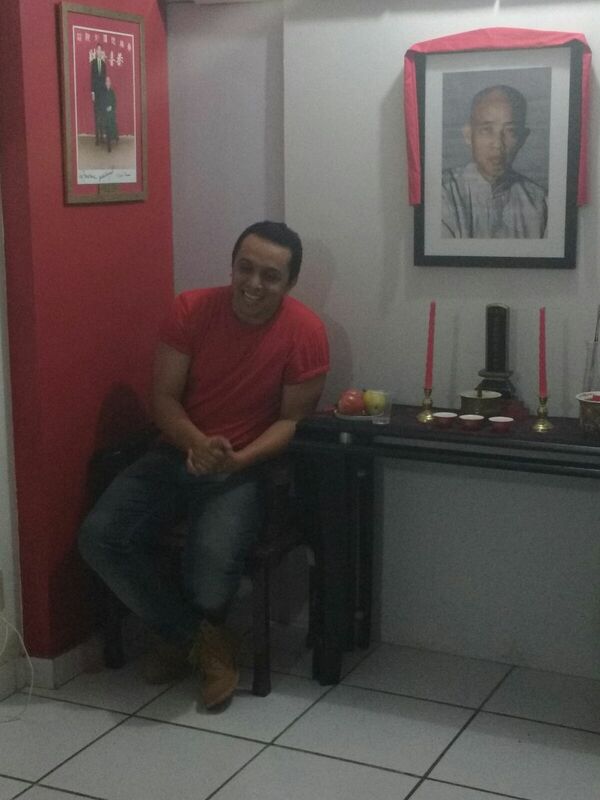 O Jiu Paai da Família Moy Fat Lei é pendurado. Jiu Paai of Moy Fat Lei Family on the wall. Não há filme que eu tenha visto mais do que o clássico dos clássicos "O Grande Dragão Branco ". E acho que todos os dias antes de ir para a escola em 1993 com nove anos eu assistia. Hoje assisto uma vez por ano, porque o pequeno Thiago dentro de mim ainda pede isso. Mas o filme não tem a mesma graça. Não porque ficou ultrapassado , mas porque eu não consigo mais me identificar com a personagem de Van Damme. Eu sempre desejei tudo aquilo: Lutas mortais, Hong Kong, calças jeans justas, uma trilha sonora do Stan Bush. Mas principalmente: Ter um Mestre! Si Fu me proporcionou isso de forma magistral . E agora, chegou a minha vez de tentar proporcionar o mesmo para uma nova geração: A décima terceira de nossa linhagem. No movie I've seen more than the classic of classics "Bloodsport". And I think every day before going to school in 1993 when I was nine years old I used to watch it. Today watch once a year, because the small Thiago inside me even asking it. But the film does not have the same emotion. Not because it was outdated, but because I can no longer identify myself with the character of Van Damme. I always wanted everything: deadly fights, Hong Kong, tight jeans, a soundtrack by Stan Bush. But mostly: Having a Master! Si Fu has given me the opportunity to call him "Master" so masterfully. And now it was my turn to try to provide the same for a new generation: The thirteenth of our lineage. 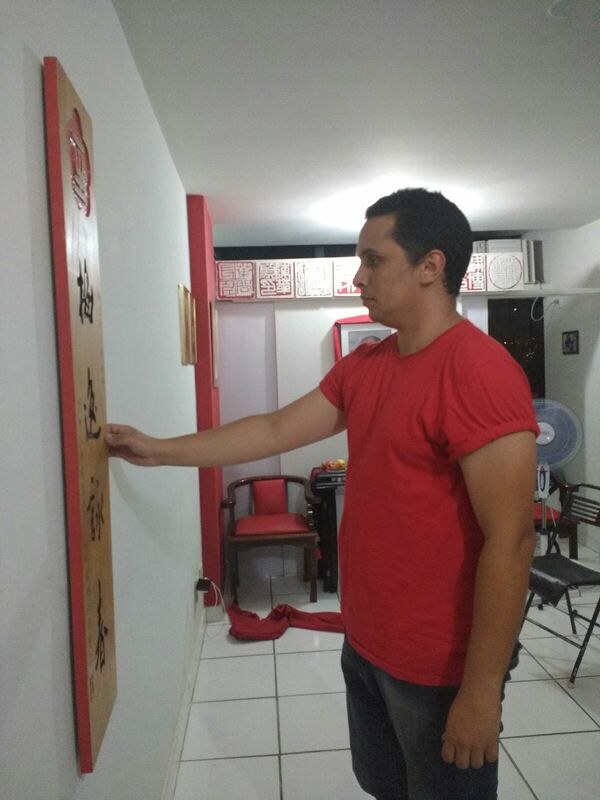 Mas para que essa noite pudesse ter a importância devida, meus irmãos Kung Fu bem mais cedo naquela tarde ajudaram preparando o Mo Gun assim como Si Suk Andre e Ursula o fizeram por Si Fu anos atrás. But for tonight I could have due regard, my Kung Fu brothers much earlier that afternoon helped preparing the Mo Gun as well as Si Suk Andre and Ursula the made for Si Fu years ago. Ficar falando de mim aqui nunca fez muito sentido, mas hoje acho que não conseguiria fazer diferente. Pois ao ocupar a cadeira reservada ao Si Fu do Mo Gun não sabia muito bem o que sentir ou o que esperar. Si Suk Ursula disse que dava um "choquinho" as vezes..rs Eu não senti choquinho..rs Mas quando me posicionei naquela cadeira para sentar, enquanto descia me apoiando nos braços dela, pensava apenas no Si Fu. Ao sentar, olhei para o alto, onde ficam os carimbos dos ancestrais e fui seguindo com os olhos um por um até a cadeira vazia ao meu lado, reservada ao Si gung da Família e olhei pra dentro. Talking about me here never made much sense, but today I think I could not do otherwise. Because to occupy the chair reserved to the Si Fu of the Mo Gun, I was not sure what to feel or what to expect. Si Suk Ursula said that the chair would give me some kind of "state of shock" lol I did not feel this shock..lol But when I positioned myself in that chair to sit down while supporting me in its arms, I was thinking only in Si Fu. 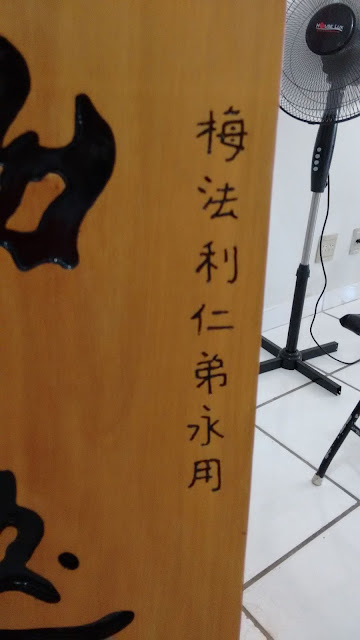 As I sat, I looked up, where are the stamps of the ancestors and was following with my eyes one by one until the empty chair beside me, reserved for Si gung of the family and looked inside of me. Meus irmãos Kung Fu presentes me fizeram perguntas sobre minha jornada até ali. Fui respondendo da melhor forma, mas devo admitir que estava nervoso. Eu nunca quis ser um Mestre , eu nunca soube que sentar numa determinada cadeira pudesse causar sensações dentro de nós. Na verdade, eu nem sabia que existia algo chamado "Jiu Paai" .Ainda que tenha passado os olhos por vários em tantos filmes da Shaw Brothers. A única coisa que eu sempre quis foi ter um Mestre. E graças a ter visto o valor que o meu Mestre Julio Camacho dava a todos esses elementos, eu aprendi a valorizá-los e acima de tudo respeitá-los entre erros e acertos. I never wanted to be a Master, I never knew that sitting in a certain chair could cause sensations within us. In fact, I did not even know there was something called "Jiu Paai" .Even having passed the eyes for many in so many films of the Shaw Brothers. The only thing I ever wanted was to have a Master. And thanks to seeing the value that my Master Julio Camacho gave to all these elements, I learned to value them and most of all respect them between hits and misses.